about this fascinating period of Oxford's history. Discover the extraordinary role that Oxford played during the early 1640s when it briefly became England’s capital. Hear hidden stories of Oxford and follow in the footsteps of Oxford's people during 1642–1646 as they lived through the English Civil War. From King Charles I to prisoners of war, military hospitals to royal lodgings, find out more about the lives and locations that shaped this city. Starting at the Ashmolean make your way around Oxford and learn about the impact the Civil War had on the city and its people. You can do the whole tour in one go which takes around an hour and a half or you can just dip in when you feel like it. The tour is free and all locations can be viewed throughout the year. Look at our map to see where all the stops are in Oxford. Click on the links below to take you to the begining of the tour. 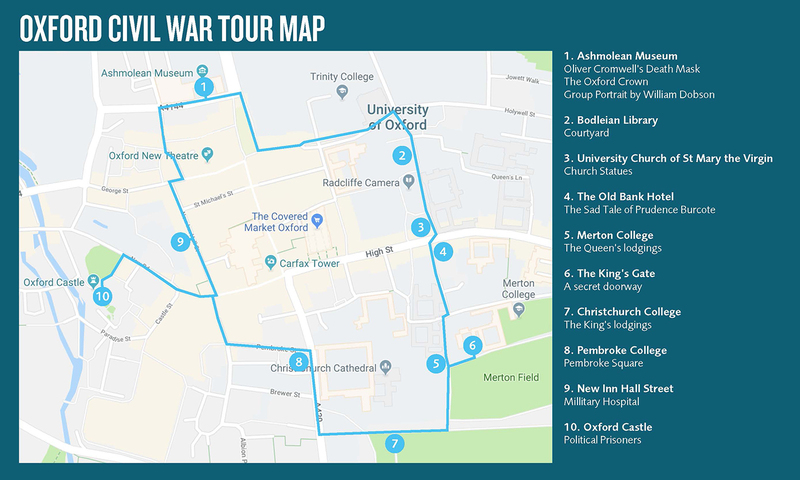 Other locations include The Old Bank Hotel, Bodleian Library, University Church of St Mary the Virgin, Merton College, Christchurch College, New Inn Hall Street, The King's Gate, Oxford Castle and Magdalen Tower.